If you follow this blog you know that I love research! If you have not checked out the resource section of this web-site please take a look. You will find it loaded with amazing studies, articles and fact sheets! As you may also know I am very involved philanthropically which is why I am so excited about the most recent report released by GrantCraft in partnership with 21/64 and the Johnson Center for Philanthropy on Next Generation Donors. Our world continues to evolve and change due to the increasing amount of technology and knowledge we all have and well used especially but the younger generations. As I have just started looking at colleges with my son I am reminded just how far the technology world has come since I applied to college. It is technology that will (and HAS) change everything. Not only will it increase our ability to learn, communicate and connect but it will also change the system itself, which includes the progression of philanthropy and charitable giving in general. While the study finds that nextgendonors and their giving values are not that different from previous generations it is the presence of technology and their increased resources that make this generation of donors so unique. The new report, “Next Gen Donors: Shaping the Future of Philanthropy“, is the first report of its kind looking at this emerging generation of younger donors and their potential to be the most significant philanthropists in history. It has been found that a relatively small group of Gen Xers and Millennials are inheriting over $40 trillion in wealth, much of that designated for charitable giving. The Greatest Generation and The Baby Boomers provided much stability to the philanthropic world and have created and guided key institutions for years. Now that generations children and grandchildren are grown up and ready to step into their elders shoes with new tools and resources. 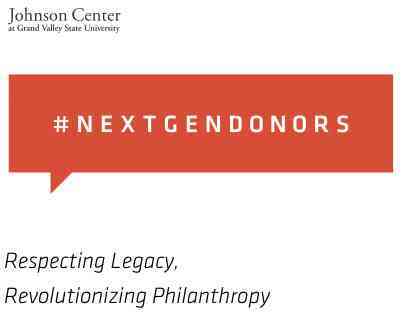 #Nextgendonors is a study to not only start the conversation about a new group of donors and to find out who they are and how they think, but about the issues and strategies that will guide major giving for decades to come. Driven by Values, Not Valuables– While #nextgendonors come from families of wealth and privliage, the study found most #nextgendonors where driven by values learned by their parents and grandparents and that they seek a balance between honoring family legacy and assessing the needs and tools of the day. Impact First– #Nextgendonors were found to highlight the importance of strategy and being more strategic in their giving. They want impact they can see, and they want to know that their own involvement has contributed to that impact. Time, Talent, Treasure, and Ties– Once engaged, #nextgendonors what to be fully involved. Giving without significant, hands-on engagement feels to them like a hollow investment with little assurance of impact. By using all of their resources and assets (time, talent, treasure and ties) and by making more than just a capital investment is what sets this generation a part. Crafting their Philanthropic Identities– These next gen donors are actively seeking and crafting their philanthropic identities in stead of inheriting the identities of their former generations philanthropic path. Happy reading and thanks to Grantcraft for the wonderful report! Previous Post Here Comes Superman….Again….